As I wrote, some people are not in a position to slow their travel. Sales people need to see customers, and indeed there is a different social dynamic that occurs in person versus remote. However. If one visits a site like flyertalk.com, where one sees the sheer mountain of complaints against the airlines, there must clearly be a better way for many people. There was a person at my company, for instance, who would commute to his customer in New York from the middle of England – on a weekly basis. Apart from what that costs in terms of dollars to our company and greenhouse gas emissions, it costs the individual too. Why didn’t the management hire someone in the New York area to do the job? Why didn’t they insist that he use TelePresence? Well, watch this space: video is really coming into its own. Cisco has led the way with TelePresence, and is doing its level best to bring people closer together through introduction of new products and services like ūmi. If video can be made cheap enough, it hopefully means an end to at least some routine business travel. Better placement of resources would mean an end to much more. But beyond that, all of these people who complain about business travel on that web site look at it as if there is nothing they can do about it. Really- to read someone who travels over 100,000 miles a year and took the time to complain leads me to ask the question I asked myself when I found myself miserably traveling: why travel if it is so miserable? How about not traveling? Or at least not flying? Or at least reducing the amount you fly? You’ll make yourself happier, spend less money, and reduce carbon emissions. Here’s one reason not to stop flying: sending a message to the airlines. They don’t care. Not only don’t they care, but they’ve learned how to make money no matter what passenger demand they have, through the ability to easily adjust their fleet size, furlough employees, and cancel flights. Load factor is the only thing they care about. You can’t affect it. By the way, people might think I find the airline industry uninteresting. I don’t. I think it’s fascinating, how planes are designed, how they’ve learned to make money in the worst of times, and how they’ve consolidated themselves into an oligopoly. But I’ll watch from a distance as best I can, thank you very much. Can America use Israel’s Security model? So now I’ve ranted about just how awful the TSA is. A friend says that we should throw them away and start doing airport security the way the Israelis do it. CNN recently carried an interview with Isaac Yeffet, the former chief of security for El Al. In the interview, Mr. Yeffet points out any number of failures, and he is particularly damning when it comes to Richard Reid, the Shoe Bomber, because our security system missed many warning signs that Mr. Reid wasn’t planning to come home, and he wasn’t planning to stay in America. In those circumstances, either you’re having a very short visit, or you don’t plan on landing. He goes on to point out how making people take off their shoes is “a patch on top of a patch.” He’s 100% right. Mr. Yeffet goes on to describe his view of strong security, the key message simply being: you have to have smart and observant people scrutinizing travelers. Of course this model could work in America, but would we get the exact same results? Possibly, but the length of the interviews will vary. For one, while Mr. Yeffet claims that they can easily determine a “bona fide” in a few minutes, the truth is that there is a clearer profile of what such a person is in Israel. Israel is a small country. They don’t need to profile Arabs or other muslims or anyone else, because they have profiled the small number of types of legitimate travelers. America is far more diverse, and hence far more difficult to determine who is a legitimate traveler. As an example, the last time I traveled on El Al, I was asked point blank why I was going to Israel, and if I am Jewish. I was going on business, I am Jewish, and I could name my temple. I think I produced a business card. That was the end of my interview. I can also say it wasn’t so easy for others who spent quite a bit more time being interviewed. And so in answer to my friend, yes. I agree with should disband the TSA and start again, with properly trained professionals who are able to better manage threats. But I do not believe that simply applying Israel’s approach will yield perfect results. The law of numbers is playing against us. Author EliotPosted on January 18, 2010 Categories Humanity, Politics, securityTags Airport Security, Israel, TSA1 Comment on Can America use Israel’s Security model? It happened again! TSA Risks lives at JFK! If there’s one thing that I can’t stand, it’s people who don’t learn from their mistakes, and here once again, the TSA has failed to learn. Once again they evacuated a terminal, took many people and crammed them into small spaces, and created a huge target for a bomber, this time in Terminal 8 of JFK. This time the incident occurred because someone went through a door he shouldn’t have gone through. Author EliotPosted on January 17, 2010 Categories Humanity, Politics, security, Stupid StuffTags insecurity, morons, stupid, TSALeave a comment on It happened again! TSA Risks lives at JFK! 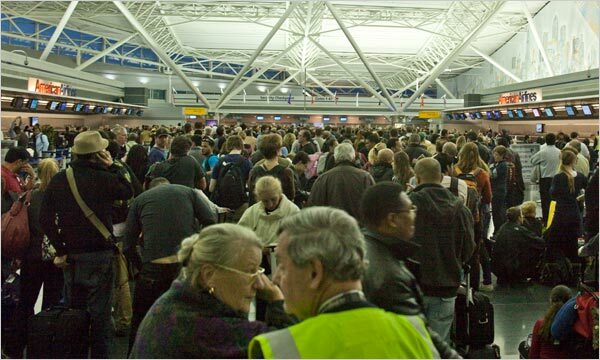 As you may already know, Newark Airport was in chaos on January 3rd due to a person walking through the exit of the so-called strerile area. The incident occurred around 5:20pm, around the time that we were sitting down for a dinner snack inside. Good thing. We were not to eat on the plane, which was scheduled to leave at 6:50pm. We boarded the plane, the door was closed but we didn’t go anywhere. After a time we were told of the breach. I packed our stuff up. Anyone who read the accidentally released TSA manual as I did would have known that this would happen once we learned that someone had gotten through. Sure enough that’s exactly what happened, which led to the scene depicted to the right, because everyone else was doing exactly the same thing. 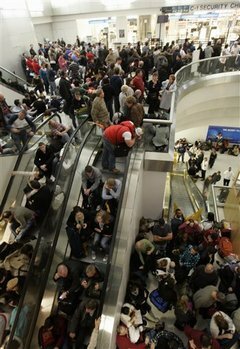 This led to thousands of people being crammed into the outside normally insecure areas of Terminal C (I say “normally”) because all passenger areas within the terminal were at this moment insecure), an event for which the airport is unprepared. For one, there aren’t so many bathrooms outside of security. At Terminal C there are no restaurants. Furthermore, it was difficult to move about. Smart and lucky people might have made their way to the AirTrain and perhaps have gotten to Terminal A, where such conveniences could be found. There were a lot of mistakes made, and many of them have been acknowledged. However, the biggest one has not. By evacuating the terminal in the way that they did, the TSA actually created a huge risk to many thousands of people by concentrating them in a small area. Had a small group of bombers walked into that area, with backpacks, not only could they have killed many people, but they also could have done so and survived. It would be the height of irony if the only portion of that terminal left intact was the secure part, while thousands were injured or worse. They might even have been able to get away unscathed. Instead of avoiding the threat, the TSA magnified it by their actions. Doing nothing would have been less risky. Use teams of people to clear people at their flights by their gates. This is human intensive and not particularly easy, but it would have at least kept people from having to leave the secured area, and thus contributing to the risk. The interesting thing is that the TSA had a whole lot of staff doing a whole lot of nothing while the passengers were exiting the sterile area. And so they could have implemented this measure in some limited way for flights that were ready to go, where all passengers are accounted for. Work with the airline to cancel flights. Nobody thought to do this because apparently they didn’t understand the threat. In fact, Continental representatives contributed to the risk by encouraging people to wait and not rebook (more on this some other time). Continental needed to position a lot of planes anyway in order to avoid utter chaos in the coming days. Use other terminals and/or buses. That is, get people to areas that haven’t been compromised, and then move them to planes. This requires a fair amount of coordination with both the airline and the port authority. Those buses may not even exist at Newark. But ultimately, there is no perfect answer to the question because each of these solutions costs money, and that requires that someone measure risk. 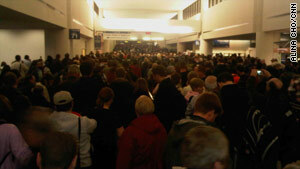 The risk of letting one person through is at most one plane of several hundred people. This is so because the cockpit doors are reinforced. A terrorist might be able to get an explosive on board, but it would be unlikely that he could use it to direct a plane into a population center, which is what Newark Airport Terminal C’s outer areas became. And there is the risk equation. 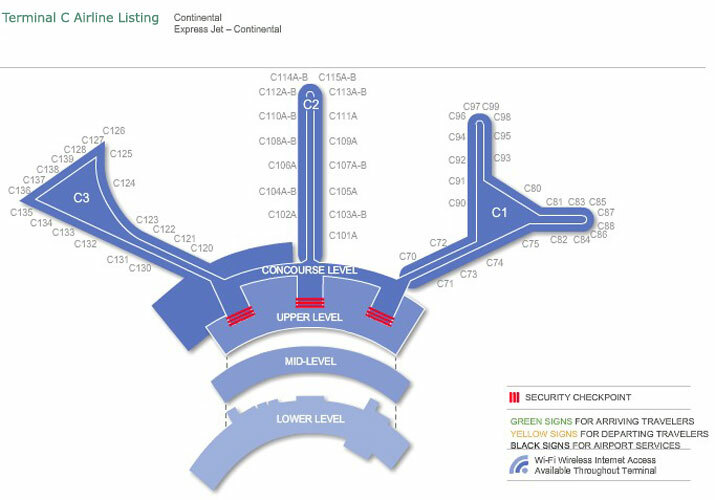 Terminal C: Thousands of us were squashed into two levels outside those red marks. Now you may say that I contributed to the risk by not leaving the area. True, I did. Indefensible. My wife and daughter should be quite upset with me, especially since I work in the business. Now it’s time for the TSA to own up. Oh, and it’s not just some local TSA guy who they can hoist this one on. Once security was breached, the local teams followed procedures in the manual.